For your next corporate or special event idea… try a Wild Hearts cruise. Catamaran sailing on the Gulf Coast is a unique and affordable way to promote team building. What a great way to show client appreciation. Why not celebrate a birthday? Tell them how special they are on your next anniversary. Looking for an unforgetable location for your wedding? Any special event can be even more special on a Wild Hearts cruise. If you have an idea we will make it happen. Wild Hearts sails daily from spring to fall. We can accomodate up to 49 passengers. Have your event planner contact us for your next corporate venue or special event idea. The ride will invigorate and rejuvenate your group and your event. Chartered Catamaran Sailing cruise on the Gulf of Mexico and our beautiful inland waters. By special arrangement Wild Hearts is uniquely equipped to provide dolphin, nature, and eco tours. Her spacious deck (30 ft wide) provides an excellent platform for viewing our local habitat. We can arrange to have a local naturalist onboard that will inform, inspire, and educate you to the local plant and animal life. Our snorkeling trips will provide you with an opportunity to enjoy our warm Gulf waters. Complimentary masks, snorkels, fins, and modern inflatable, non-encumbering life vests are provided for all guests who wish to enter the water using our custom designed boarding stairs. These stairs make it easy for even our non-athletic guests to enjoy the water activities. 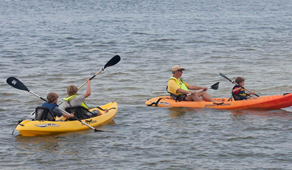 Wild Hearts has kayaks, SUPs (stand up paddle boards), surfboards and floats available for special events. Our local area waters abound with numerous dolphins that can be viewed in their natural surroundings as nature intended. We never feed or chase the dolphins. We let the dolphins come to us… AND THEY DO!! !